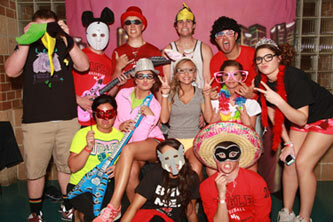 We are one of Wichita's original photo booth companies. With over 10 years of experience we have worked in most Wichita venues and at all kinds of events. We will help entertain your wedding or party guests and you will have lots of pictures to enjoy. As a photographer picture quality is an important part of what we want for you. Our booths use digital cameras and studio style lighting to give your guest the best photographs possible. Are we the only ones who do that? No, but many don't so when comparing photo booth companies look at their pictures and decide for yourself. We are professionals who are dedicated to the operation of the photo booth. We are not there to play music or take care of anything but the entertainment of your guests in the photo booth. We are available for weekday events and have special discounts available for those events. Our booths have many options including fully enclosed or open air and we are willing to work with you to create a unique experience. Don't let your photo booth be a boring part of your event. Guests can also select their picture layout while in the booth. All of these options help make the photo booth more entertaining. With green screen technology your guests can pick their own background. We have hundreds of green screen backgrounds available. If you have a scrap book it makes it more colorful. We also have 19 different backgrounds including floral and metallic. You have choices with us. Your booth can be open-air or enclosed for privacy. We also have a retro option as well as small booths for the smaller venue. Guests are free to post their pictures on social media, email or text. We also have an option for slide shows of photos from the booth. This can be a handy feature to show thank you to sponsors for charity events. Guests can leave a special video message while in the booth. We will watch all videos and create a DVD of family oriented messages and if needed a full DVDs with some of the "other" marital advice. - Everyone in the picture receives their own copy. - Quality Pictures. Digital cameras for clear photos of your guests having fun. - You receive all images. - Great prop selection. Your guests will enjoy the selection of props. - Experience: We have been providing photo booths since 2009. - Personalized layouts: Even if we are not doing social media you will receive a 6x4 version of the sessions. - Background Options: With our green screen technology we have over 500 backgrounds available. You can even give us a picture and have it appear as the background behind your guests. - Online access to all of the photos within 24 hours. - Engaging professional attendants. Our booth attendants will work with a master of ceremonies or a DJ to make sure people know that the booth is there and to help your guests. Saturday is our biggest rental day and that is when we often have all booths reserved. If you have an event which is not Friday or Saturday night we will work with you on special rates. We also offer discounts to non-profit organizations and charities for fund raising. These are at our discretion so please contact us early. Please check out our FAQ page to learn more about these type of events. We also have special pricing for daytime events and non-Saturday events. Our current after-prom package is $395 for three hours for a booth that prints and $299 for a social media only photo booth. This can include a slide show, social media, and many deluxe booth features. Please contact us to tell us about your event and let's see what we can create. Other possibilities than a traditional photo booth. Roaming Photo Booth Photos. We would like to roam through your event and take photographs of the guests in an interactive and fun manner. Images will then be printed at the booth for pickup. Offer a photography set which is more than a background. We can work with you to come up with a scene that people can interact with, climb on, or simply become a part of. This would give your event photo booth photos a unique look. Interactive Photos. All photo booths have the ability to take photographs automatically based upon a timer. That is the traditional approach for a photo booth. One of our software packages allows us to take the photographs manually and that gives us the ability to talk to your guests and work to get them in just the right pose and moment when the camera takes their photograph. Bringing fun to weddings, bar and bat mitzvahs, corporate and private parties since 2009. 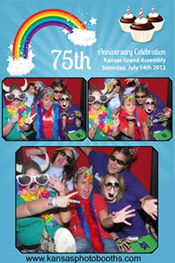 If you would like to see even more examples please visit the Kansas Photo Booths website.